This quiche is really neat. It makes it’s own crust!! Which is cool because A.) making pie crust is a pain and B.) store bought pie crusts are one of the worst-for-you processed foods. This quiche has some flour whisked into the egg mixture, and as the quiche cooks, the flour sinks to the bottom of the pan and creates a nice thin little crust. It’s pretty bomb. My sister-in-law made this for us when she stayed at our house a few weeks ago and I’ve been dying to make it again myself. We always have so many quail eggs around, so quiches are perfect for using them up. Spinach and feta are a delicious Greek-y combination, but you can really use any kind of greens in this. I’ll tell you a little secret: I actually used some of my rainbow chard in here instead of spinach. But you could also use beet greens, turnip greens, kale… whatever leafy green you have on hand! Preheat oven to 400 degrees. Spray a pie pan with nonstick spray and set aside. Heat oil in a medium skillet over medium-high heat. Add the onion and cook until soft, about 5-6 minutes. Add the greens and cook another minute, just until wilted. Set aside to cool. In a large bowl, whisk together eggs, flour, baking powder, salt and pepper. Whisk in milk, then stir in greens mixture. Pour into prepared pie plate. Top with sliced tomatoes and feta cheese. Bake 25 minutes, or until center is set and the outside edge is golden brown. Let cool 5 minutes before slicing. I am off to a busy week! My sister arrives in town tomorrow and then we head to Vegas for our half marathon. I’m not really sure where the last month went! Am I ready?? I sure hope so! Yes, you need to make quiche! They are so easy and great to keep in the fridge to reheat ANY time of day! This is like magic! I’ve never heard of this “makes its own crust” quiche technique. I can’t wait to try it! Especially since making pie crust and rolling it out is the worst part of a quiche. This is so great Jess! Yep, it’s pretty cool! It’s no crispy bakery crust, of course. But it really gives it some depth of flavor and heartiness! I’m kind of obsessed. I always think that any Greek ingredient recipe is enhanced by the addition of a little oregano, this one included. I love the flavors of this quiche, Jess! Spinach and feta were meant to be together! 🙂 And not having to make a crust is wonderful! Sounds like the perfect breakfast (or lunch or dinner) to me! I’m so intrigued by this quiche, Jess! That is such a cool idea to put some flour in so it forms a crust on the bottom! I’m really going to have to try that out just to see what it is like 🙂 I’ve also never had quail eggs before, how neat! I love crust-less quiches! Because like you said, it’s such a pain to make it. 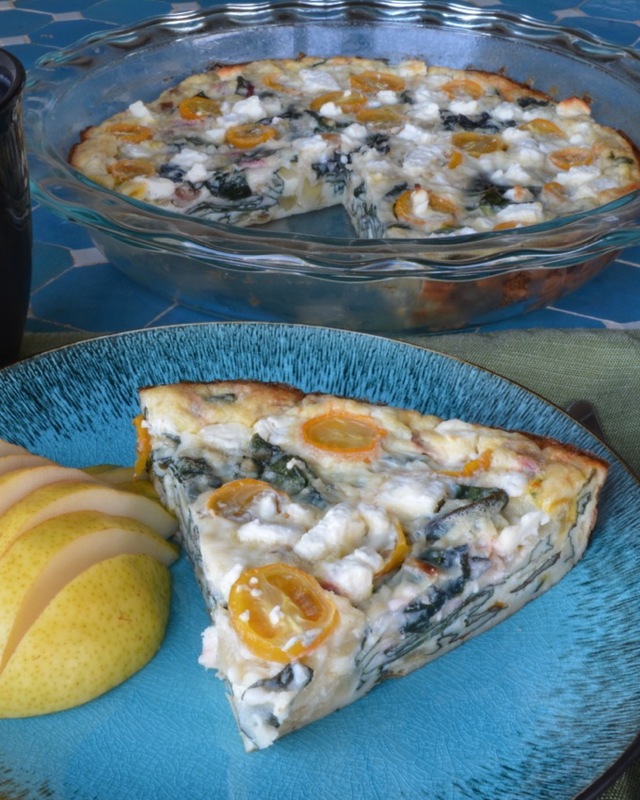 Spinach and feta together is seriously my jam and I so can’t wait to try this quiche! This is cool! I tend to make crust-less quiches (aka frittata’s) more so I don’t have to deal with the crust, but I have make mini quiches with a quinoa crust before! They don’t really sink to the bottom if they are mixed in but I still thought that was cool. I’m going to have to try this version! Wow, love this crust magic thing! Plus there’s feta and spinach involved, always a winner! Good luck for your half marathon, can’t wait to hear how it went! Aren’t quiches the best?! I can never get enough! It is often my go to for dinner when I can’t think of anything else to make! Whaaaaat!! They are so good!! You HAVE to try!! Nice! The ‘rents have hens so now I have access to really good eggs and need uses for them! The quiche is SO up my alley! 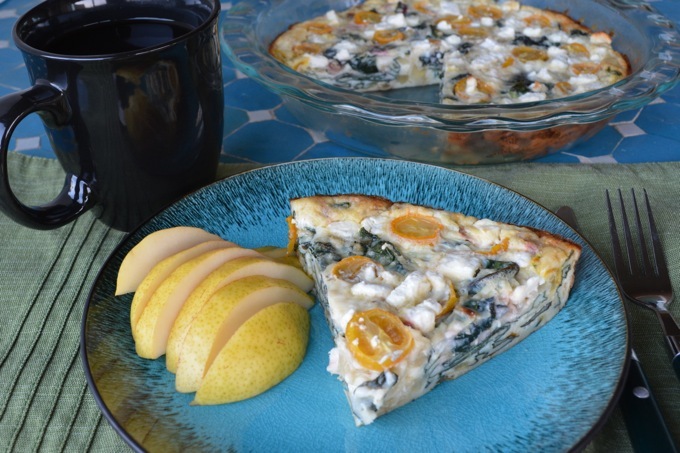 I love spinach and feta quiche, even better that it makes its own crust! I doubled the recipe, baked it in a 12-1/2″ X 9″ pan and cut into squares to serve as an appetizer for a party. I added about 15 minutes to the baking time. It came out great and was gone as soon as I put it down. Delicious!